This is a Rich, Full bodied dark porter that delivers a smooth taste that chocolate lovers will adore. 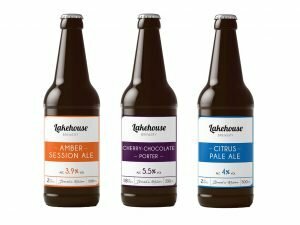 They have added real chocolate to boost the natural mocha flavours of the four dark malts that give this beer its distinctive character. It offers a deep, rich roasted flavor, that tastes like a dark chocolate ensemble of flavors. This 330 ml bottle uses the distintive meantime logo. It is described as the ultimate beer for chocoholics. The whole bodied flavor leaps from the glass as you pour the dark and brooding contents from the glass.Meantime Chocolate Porter is similar to drinking liquid chocolate mousse, made with rich, bitter chocolate. It offers a warm and comforting with a silky overtones. The bottle confirms it is as a ‘Rich dark Beer with four different roasted Malts, Matured with real chocolate. The sugested foods for the beer are with casseroles, spicy Mexican dishes or raspberry desserts. Overall: a robust porter that delivers a true dark chocolate taste.